Tinkering Battlefield 3 soldiers released a mod today allowing tweaks to the displayed color levels , with the most dramatic result involving the suffusion of the pervasive blue-tinged gradient into supposedly more natural colors. The sample photo album and comparison video definitely show a stark difference between stock and modified visuals, but when asked for his input on the mod, Battlefield 3 gameplay designer Gustav Halling said it was " too colorful " and warned of possible permanent bans for users. "[It's] too colorful," Halling tweeted. "Also, I wouldn't use those hacks if you don't want a permanent ban on your account. FYI warning." A few posters on a reddit thread discussing the mod claim they've already met bans for using the program. 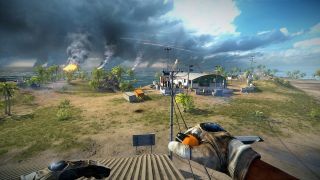 Although the notion of DICE hefting its ban-hammer over Battlefield 3 becoming too colorful seems absurd on the surface, the company is clearly adamant about protecting the competitive standards set in the unmodified game, where filters and gradients could potentially figure into each map's overall balance.